Announced by the United States Healthful Food Council (USHFC) on July 15, Stanford is the first campus in the United States to be REAL Certified for its dining program. “The Responsible Epicurean and Agricultural Leadership (REAL) Certification program is a trusted, nationally-recognized mark of excellence for food and foodservice operators committed to nutrition and environmental stewardship,” said Shannon Munz, communications coordinator of Residential & Dining Enterprises (R&DE) Stanford Dining, in an email to The Daily. “Therefore, being recognized by the United States Healthful Food Council as the first university dining program to be REAL Certified validates our commitment and dedication to nutrition and sustainable best practices,” Munz added. 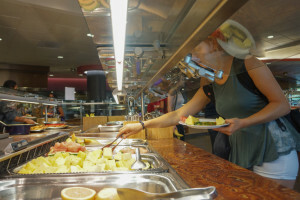 According to the USHFC website, USHFC’s third-party registered dietitians inspect restaurants, corporate cafes and cafeterias such as R&DE Stanford Dining. Food services are evaluated across various criteria such as “the utilization of vegetables, fruits and whole grains” and “moderate portion sizes.” Only food services that meet the necessary requirements are awarded REAL Certification. This year, R&DE Stanford Dining also received the 2015 Hobart Center for Foodservice Sustainability Grant for being “the most innovative and best-executed foodservice sustainability organization of the year,” said Munz. According to Munz, R&DE Stanford Dining aims to increase efficiency, educate students and staff and promote sustainable habits through its Sustainable Food Program. “Our guidelines are informed by the most current science and research available and draw upon the input and involvement of many stakeholders within our campus community with the goal of improving the overall health, safety, security and sustainability of our food supply,” she added.